Joel began his career in New York City in the jewelry industry in the late 60’s. He earned the title of Graduate Gemologist from Gemological Institute of America in 1977. He has built a career of over 49 years in the manufacturing and retail jewelry business. Joel has worked with renowned companies such as Tiffany and Co. and Dayton Hudson in Minnesota. Eventually, his love for horses brought him south to the Augusta-Aiken area where he moved his manufacturing business in 1990. Over the years, Joel has expanded his business from a focus on The Estate Jewelry Center to what is a now one of the leading diamond engagement and wedding ring stores in the Southeast all under the name Crown Jewelers. Joel’s philosophy over the years has always been - If you think that customer service is thing of the past, come experience the difference and see why “Royal Treatment makes Loyal Customers”- Joel Conte. Crown Jewelers is a full service family jeweler. Our in-house expert jewelry services include ring sizing, appraisals by two graduate gemologists, custom jewelry design, pearl restringing, silver & glass engraving, and watch batteries. From our vintage inspired rings to the new halo designs, select from our assortment of over 2000 styles of diamond engagement and wedding bands. For the customer looking to reset Grandmother’s diamond, Crown Jewelers offers the best choices for recreating your family heirloom. If estate jewelry is your passion, we have a unique selection dating from the late 1800’s to the present. For that special occasion, we have an extensive selection of diamond and colored stone pendants and earrings in both silver and gold, pearls, silver lockets, and baby jewelry. Many of our engraveable gifts include men’s cuff links, pewter mint julep cups, baby rattles & cups, silver frames, silver charms, and many other wedding and baby gifts in price ranges starting at under $25.00. Our knowledgeable staff is here to help and guide you in a friendly, no pressure atmosphere where customer satisfaction is our number one priority. 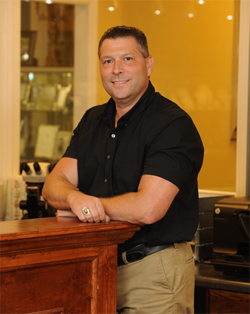 Brian began his career in the jewelry business in 1991 as an apprentice to A.A. Friedman Co. He learned many aspects of the jewelry business during his 10 years with the company. He branched out on his own as an independent jeweler servicing many stores in the surrounding Aiken-Augusta area. He then furthered his career by opening a retail store, K-Bee Jewelers, in Aiken, SC. Brian eventually joined forces with Joel Conte at Crown Jewelers in Augusta. 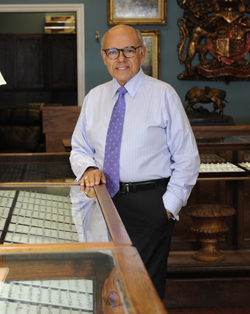 He is an expert goldsmith with a specialty in the restoration of treasured family pieces. Brian also specializes in computer engraving on fine silver and glassware.